Jill Kiehl was seven months pregnant when her husband, Army Spc. 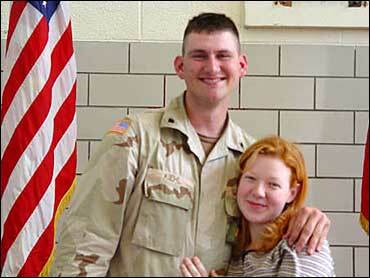 James Kiehl, was reported missing with other members of the 507th Maintenance Company after an ambush in Iraq. In the first week he was missing, she lost five pounds. Her parents had to remind her she needed to nourish herself and her baby. After 12 days, Jill Kiehl learned her husband was dead. The grief was overwhelming. But even more powerful was a survival instinct, one telling her she must go on because she had a baby to bring into the world. "I was more concerned about getting ready for him (the baby) than trying to think about everything that happened," she said. "If I had thought about everything that happened, I'd probably have had a nervous breakdown or something." Five weeks and three days after she learned of her husband's death, 22-year-old Jill Kiehl gave birth to Nathaniel Ethan Kiehl. For her, as for other young mothers and a few fathers, the deaths of loved ones in the Iraq war and aftermath means struggling with grief compounded by their children's sorrow and needs. In addition to scores and scores already raising children when the military came bearing the news, at least 11 women were pregnant with sons and daughters who will never know their father. Others had just recently given birth when the news came. For Jill Kiehl, an especially hard time came a few weeks after the baby was born. Nathaniel slept most of the time. Her parents and sister returned to work. She was left alone with her thoughts. "I turned to God a lot. I was just praying to get me through this, get me through this day and make it until my parents get home and I have somebody to talk to," she said. She still has bad days - and bad nights, when "just before you go to sleep, you think of everything." But now, more often she'll run across a picture or something of her husband's and laugh, remembering his sense of humor. That's what caught her attention from the beginning. "He was goofy. He had a good sense of humor," she said. "He was smart, but he didn't hold his intelligence above anybody's head like he was better than anybody else. He was an all-around good person." A few weeks after her husband died, Kiehl received some of his belongings - his jacket, military ID, driver's license, Social Security card. She hopes they might help her someday explain to Nathaniel about his father. "I don't know when he's going to start noticing when he doesn't have a dad," she said. "Once he's at a certain age, he can understand everything. Then, I'll sit down and tell him the whole story if he wants to hear it." She expects the holidays to be difficult. James Kiehl would have turned 23 three days before Christmas. But she's looking toward the future - preparing to return to college next spring - and knows that's what her husband would have wanted. "He doesn't want me to sit here and be sad about it. He wants me to look at his life and be happy that I got to know him and love him." Nathaniel wakes up after his afternoon nap in the living room near a brightly decorated Christmas tree. Above him on the fireplace mantle is the carefully folded flag given to his mother at his father's funeral service, displayed in a glass case. He smiles at hearing his mother's voice and gives her sly little sideways glance. "Every once in a while, he'll give me a look out of the corner of his eye and I'll go, 'Oh, that's James,' " she said. Timothy M. Conneway went to Iraq charged with excitement - he had just found out that he and his wife were expecting a baby boy. "He called his parents and made it sound like the baby was here: 'We're having a boy!"' 21-year-old Cathy Conneway of Clarksville, Tenn., remembers. Just a week after sharing the big news, 22-year-old Army Sgt. Tim Conneway died June 28 after an explosion in Iraq. Married for eight months, the couple were expecting their first child on their wedding anniversary, Nov. 21. In the months that followed, Cathy Conneway often found it hard to get up in the morning. But she reminded herself that she was living for two. "It was hard, but I think it was the baby that made me have to be strong because I didn't want to be unhealthy," she said. "There were days where I cried all day and I tried to stay strong for the baby - it was all I had left." On Nov. 25, Timothy Michael Conneway Jr. was born - and his mother felt a sudden calm. Sporting a head full of hair, Tim Jr. looked just like his dad. "I was relieved that I had a part of Tim with me," she said. Before his death, her husband had excitedly tossed around potential names avoiding making his son a junior, but Conneway said she felt it was only appropriate to keep Timothy's name alive. Conneway wants to love and care so much for her son that he won't feel like he's missing a parent. But the grieving is still fresh. "There are days I get really mad at Tim for leaving, but then I know I'm not mad at him. I'm not able to express the emotions I want to sometimes - I have to stay healthy," she said. Despite pushing herself through the past painful months, the young widow knows even more emotional challenges lie ahead. "I'm dreading the day when he asks me, 'Mommy, where's my daddy?"' she said. "When he asks that, there won't be a day that will go by that he won't know who his daddy is and what his daddy did for his country and what he did for him." Jamie Miller's nightmare started when she was six months pregnant: Her husband, Army Staff Sgt. Frederick L. Miller, was killed Sept. 20 in an explosion in Iraq. Miller found herself having trouble eating. She lost weight, and broke down in tears often. Finally, she realized she didn't want her unborn son to inherit the sadness - only the positive attitude of her husband. She decided to put her sadness to the side and focus on staying healthy. "I thought about what my husband would say and he'd say make sure you're taking good care of yourself," she said. Miller gave birth Dec. 5 to Zachary Jacob Miller, and three days later said she was excited - "just knowing he's healthy and everything." "I'm looking forward to the future," said Miller, 28, living with her parents in Bradenton, Fla.
Frederick Miller had written his wife a letter dated Sept. 20 - the day he died - and she received it about two weeks later. In it he talked about playing volleyball that morning, and said he wished he could contact her but the phones and Internet connection were down. Miller has saved that letter - and all the others - to give to her son. But for now she can't bring herself to re-read them. She knows she's not alone in her situation, but sometimes it feels like it. "I just wish they would actually give you a support group," she said. "I don't consider myself alone in this situation - there are other women going through this as well. But that wasn't even offered. I don't know if there's even a support group that exists." And though she's heartbroken, Miller said she is not bitter about her husband's death or the war in Iraq. "I truly believe my husband wanted to do what he was doing so that brings me a lot of comfort," she said. "My husband loved what the military was about and he loved defending the country. I think if my son felt the same way, I would encourage him because I think we need more people like that in the world."